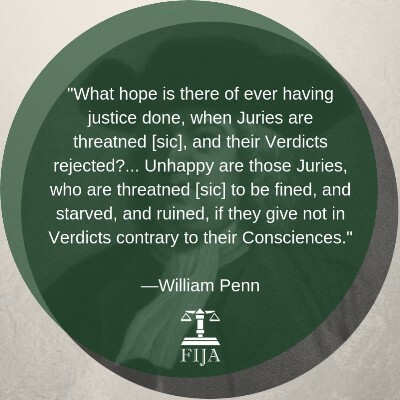 On September 5 each year for more than 25 years, FIJA has celebrated Jury Rights Day as our signature day of educational outreach. On this day in 1670, William Penn of London was arrested for publicly preaching the Quaker religion in violation of England’s Conventicle Act, which outlawed the public practice of religions other than the Church of England. Though he had technically broken the law, Penn pled Not Guilty. Nonetheless, the court repeatedly demanded that the jurors find Penn guilty, rejecting any other verdict and sending them back to deliberate again and again. To coerce jurors to convict Penn under this unjust law, the court jailed the noncompliant jurors in England's notorious Newgate prison during deliberations. The court withheld from them food and water, tobacco, fire, and even so much as a chamberpot. Despite this abuse, jurors refused to comply. Eventually the court accepted their Not Guilty verdicts for both Penn and Meade, but then fined them forty marks each in punishment and sentenced them to confinement once again in Newgate prison until their fines were paid. Some of the jurors appealed the fines and imprisonment. In this appeal, known as Bushel’s case after the jury foreman Edward Bushel, the higher court ruling confirmed that jurors cannot be punished for their verdicts, even if a law has technically been broken. Penn’s and Bushel’s cases not only firmly established our jury rights in the common law tradition, but also laid a foundation for freedom of religion, freedom of speech, and freedom of assembly that we hold dear still today. Jurors’ refusal to enforce unjust or unjustly applied laws is known as jury nullification, jury veto, or conscientious acquittal. It is a crucial tool that citizens have to restrain government. This authority is our peaceful protection to stop corrupt government servants from violating our rights. Sometime in September, whether or 5 September or later, spend an hour in front of a local courthouse with friends sharing FIJA brochures. We’ll even provide a free event kit if you organize one! Speak to a local civic group or school about the history of Jury Rights Day and the protective role of the jury. Submit an op-ed or write a letter to the editor of a local or national publication or website discussing jury nullification and Jury Rights Day. Call into or be a guest on a talk radio show to discuss jury rights. Post a Jury Rights Day status on your Facebook page and link to the official FIJA Facebook page to help educate more prospective jurors. Be sure to join the Jury Rights Day 2018 event page on Facebook to show your support and keep up as we share announcements, resources, and so on as we help you gear up for Jury Rights Day. Please also feel free to e-mail us your Jury Rights Day plans if you would like us to help publicize them through our website and social networks.